CLICK HERE to visit the website dedicated to this wonderful Women's Retreat hosted by Kyla Rowland. Concert Poster available for download. 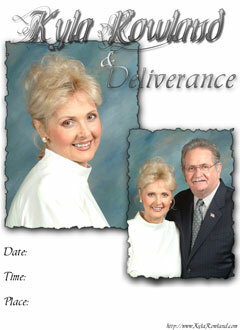 Use this poster to help advertise Kyla Rowland and Deliverance at your next function. Right mouse click and choose "Save As... "